The Vietnam legacy of mistrust reared its head in the sands of the Middle East as the Pentagon and the press clashed over coverage of the 1991 Gulf War. Two decades earlier, the military had blamed the media’s brutal reporting for undermining the war effort in Southeast Asia-and Pentagon officials were determined not to lose control of press coverage again. As soon as the Vietnam war ended, military officials were hard at work on plans to limit media access to the next war. Did the Pentagon provide the media with the information the American people deserved and which a free press should guarantee? Would media demands for more access have led to situations where lives were jeopardized and the American cause was compromised? 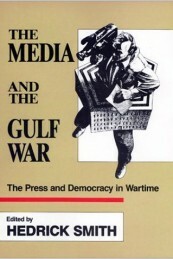 In The Media and the Gulf War those questions are answered by experts on all sides of the issue-members of the media, the military, and the government. The contributing commentators include those who became household names during the crisis-CNN correspondent Peter Arnett, Pentagon spokesperson Pete Williams, General Thomas Kelly, leader of the Washington briefings on Desert Storm-and a host of other media and military commentators with special access, arguments and analysis. All bring forceful insight to the complicated role of the press in a free society.